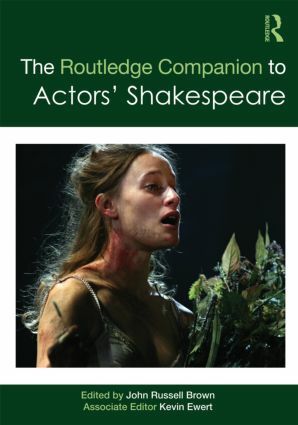 The Routledge Companion to Actors’ Shakespeare is a window onto how today’s actors contribute to the continuing life and relevance of Shakespeare’s plays. The process of acting is notoriously hard to document, but this volume reaches behind famous performances to examine the actors’ craft, their development and how they engage with playtexts. Each chapter relies upon privilieged access to its subject to offer an unparalleled insight into contemporary practice. This twin volume to The Routledge Companion to Directors’ Shakespeare is an essential work for both actors and students of Shakespeare. John Russell Brown is scholar, director, writer and teacher. He has been an Associate Director of the National Theatre in London, an Arden editor, author of a dozen books on Shakespeare and contemporary theatre by Palgrave and Routledge, editor of the Oxford Illustrated History of Theatre and an energetic editor of several series on theatre study and practice. Kevin Ewert is the Director of the Theatre Program at the University of Pittsburgh at Bradford. He contributed to The Routledge Companion to Directors’ Shakespeare and is one of the Series Editors for Palgrave's Shakespeare Handbooks.